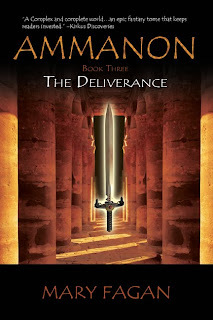 AMMANON Book Three, The Deliverance, has FINALLY gone to press! Let no cockeyed optimist tell you that Murphy's Law doesn't exist! After the relative ease with which Books One and Two went through production, I was pompously considering myself a seasoned author. Not so fast, Fagan! In all fairness, I should preface my venting by saying that the publisher has since (today, actually) sent all its authors a letter explaining the obstacles faced this past year. Even with what I now admit is an extremely limited understanding of the process, I realize the staff was doing the best they could under very trying circumstances. So bear that in mind as I rant. First of all, communications delays were monumental. Emails from the cover artist, for example, took weeks instead of hours. And during those lapses of time, any understanding of my messages vanished. Assuming the message got through at all. Second, I couldn't get questions answered until it was too late to make changes. Well, it could be done, but since the manuscript had already gone to galley, it was costly and time-consuming. Two weeks after changes had been submitted to the galley proof, I attempted to gleen a status report from Customer Service. The reply came in a remarkable 2 - 3 days: "You should be receiving your galley proof within the next two weeks." Ya think? Nevertheless, the mountain has been climbed by publisher and author alike, and I'm looking for a release no later than January 20. And, after all that, it really doesn't look too bad, does it? There's really no lesson to learn here, other than patience. The economic crash last year and the rollercoaster market ride every since wreaks its havoc on all of us. Sort of reminds me of the electronic signs along the freeway: "Pile up at I-45 and 610 Loop. EXPECT DELAYS."